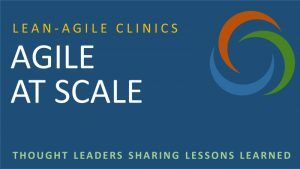 The Agile at Scale clinic is designed to help people attempting to do Agile beyond the team, whether it be small scale (< 50), mid-scale (50-300), or large-scale (300+). Much of this focuses on general Lean-Agile approaches. Because the Scaled Agile Framework (SAFe) is a particular approach to Agile at scale, it has its own section in the clinic. Leaders and managers aren’t looking for “Agile at scale;” they are looking for ways to help their software organization do a better job for the company. And just as importantly, to be noticed within the company (especially its higher levels) for doing so. The value of Agile at scale is that it is helpful towards both ends. I care about the business performance of our software organization. Is Agile at scale justified by business results? Our results from expanding Agile have been mixed. What do we have to do to get Agile at scale working? The first question is for if you’d like to see more about how Agile at scale can help. We will be adding information about this as we go. The second question is the subject of the rest of this clinic. The clinic is organized into five sections; each section focuses on a general topic in doing Agile at scale and offers a collection of frequently asked questions we have heard in our coaching experiences and from users of this portal. Only “take” the sections that apply to you. For instance, if your organization is small, the “Foundations” section may give you all the answers you need.